Planet Earth is seemingly awash with water - we call it 'the Blue Planet'. But how much accessible fresh water is there? Very little. 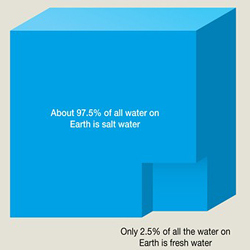 Only 2.5% of all the water on Earth is fresh water and more than 97% is saltwater. Of this 2.5% of fresh water, more than two-thirds (68.7%) is frozen as snow and ice, and more than one-third is stored below ground as ground water. This means that only 0.3% of all fresh water on the planet is readily available as surface water in lakes, swamps, rivers and streams (Gleick, P. H., 1996: Water resources. In Encyclopaedia of Climate and Weather). It’s remarkable to think that the global population and all living species are supported by such a small amount of all the water on the planet! For how much longer will this be the case? Water is constantly circulating around the planet in a system called the ‘hydrological cycle’. Watch the following video to learn more about how water makes its way around the world and contributes to the presence of different ecosystems across the planet. The amount of water a country or region has - e.g. precipitation, the presence of rivers or lakes and groundwater stores. The number of people and uses that water has to support - their individual demand/consumption of that water. Although the absolute quantities of fresh water on earth have always remained approximately the same, the uneven distribution of water and human settlement continues to create growing problems of fresh water availability and accessibility. Uncertain water availability is a challenge faced by a growing number of countries, and one that can impact upon economic growth. Water scarcity occurs when the amount of water withdrawn from lakes, rivers or groundwater is so great that water supplies are no longer adequate to satisfy all human or ecosystem requirements, resulting in increased competition between water users and other demands. 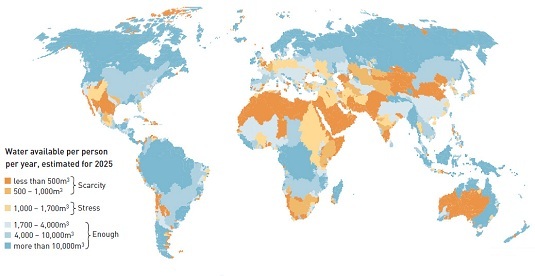 Currently about 40% of the world's population live in water stressed areas. This is projected to be 50-65% by 2025. By 2050, nearly half of the world's population will be living in areas where water is scarce yet 90% of all population growth will occur in those regions. Q. Find your country on the map. How is the water situation looking in 2025? Q. Might you be affected by changes in water availability (directly or indirectly)? If yes, how? If not, are you sure? Read how attitudes to water are changing later in this module. Look at the Taking Action pages for ideas on how you can reduce your impact on freshwater systems now and in the future. Although we are viewing water availability in terms of human needs, it is also a vital requirement for all living things and the ecosystems that support them, and us, through ecosystem services. More than 1.4 billion people are now living in river basins where modest environmental water requirement levels are already in conflict with current water use, and this number is growing (Smakhtin, V.; Revenga, C.; and Döll, P. 2004). If we assume a need to satisfy this ecological water requirement, this is likely to exacerbate the human water scarcity. Which leaves us with a future dilemma - does the human requirement for water (for all our ‘needs’, not just basic drinking and sanitation) outweigh the ecological? And if so, at what cost in the long-term? Globally, not only do we rely on less than 1% of the total fresh water to support an estimated 7 billion people worldwide, but the accessible water is unequally distributed. State of the world's water - information on the water cycle and fresh water resources. The World Water Development Report 3 (Chapter 10) - detailed information on the Earth’s natural water cycles and availability of freshwater resources. Taking into Account Environmental Water Requirements in Global-scale Water Resources Assessments - Comprehensive Assessment Research Report. Next > Why Invest in Water?